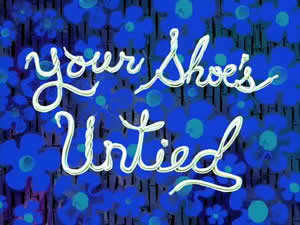 Your Shoe's Untied (Episode) – From SpongePedia, the biggest SpongeBob-wiki in the world! Your Shoe's Untied is an episode from Season 2. This episode starts out with SpongeBob watching TV. Then Patrick comes bursting through the door with a pair of shoes on his hands. SpongeBob asks to see them on his feet and Patrick says that he does not know how to tie his shoes. SpongeBob says that he will teach Patrick, and unties his shoes. However, when he tried to tie them again in order to show Patrick, he realizes that he has not tied his shoes for so long that he has forgotten how to tie them. After Patrick leaves, SpongeBob goes to bed but when he wakes up he still does not remember. He still has to go to work though. It takes a while for SpongeBob to get to work because he keeps tripping over his shoelaces. When he finally gets there, Patrick's there, eating a burger. He does not want to look bad in front of Patrick so he pounds his feet into the floor boards so that Patrick can't see them. Patrick asks if SpongeBob has gotten shorter and SpongeBob says yes. He makes two big cracks across the floor as he slides his feet in the floor. When he gets inside the kitchen he crawls while lying down to the grill. He makes a Krabby Patty, and then tries to give it to Squidward but can't make it without tripping. So he trips and throws the Krabby Patty into Squidward's mouth. After doing this several times, Squidward is seen from behind and he's huge because of eating all those Krabby Patties. Mr. Krabs then comes out of the bathroom in his underwear, all the customers leave, and he asks Squidward what's wrong. Squidward replies that it's all SpongeBob's fault and Mr. Krabs calls SpongeBob out. SpongeBob tells Mr. Krabs that he can't remember how to tie his shoes so he asks him for help. Mr. Krabs does not wear shoes, so SpongeBob finally cracks and starts asking everyone if they know how to tie laces. Everyone says no, but then SpongeBob encounters The Flying Dutchman, who teaches SpongeBob various knots except the one SpongeBob needs to tie his shoes. So SpongeBob goes home thinking that he'll never tie his shoes again, but Gary, surprisingly, ties his shoes for him. SpongeBob, amazed, asks Gary where he learned to tie shoes and Gary puts on a record. A song starts playing about how to tie your shoes (Loop dee Loop). After the song, the episode is over. Ween sings the song "Loop de Loop". When Gary tries to get SpongeBob's attention, the lights are off. Then, when he has tied SpongeBob's laces and SpongeBob says "Well, I'll be! You can tie shoes! ", the lights are on. Right about when SpongeBob enters the Krusty Krab kitchen, his skin turns a darker yellow for the rest of the episode. When one of the customers says, "This is the worst service we ever had. We're going to the Chum Bucket!" after he or anyone else does not get food, neither he nor anyone else heads towards the Chum Bucket at all. At the start of the episode, SpongeBob is watching what appears to be a sea documentary. When Gary enters the room, SpongeBob embarrassingly switches stations, suggesting he was watching a football match. Notice he moves closer to get a better look with wide eyes. Interestingly, in the episode The Sponge Who Could Fly, when Patchy is flipping through channels, this show was seen for a split second. Also, in the episode Rise and Shine, Patrick is seen watching it, too. When SpongeBob first goes to his grill, the patties are already cooking, even though he just got there. SpongeBob says they have been tied for as long as he can remember, (implying that they have been tied since he was born), but around the middle of the episode Rock Bottom he ties his shoes. SpongeBob mentioned he's the only one to wear shoes but later in the series people is seen wearing shoes. Harold is Naked in this episode. It is possible that Gary tied SpongeBob's shoes with his arms, which is shown in the episodes The Gift of Gum and Grooming Gary. This page was last modified on 12 August 2010, at 14:19. This page has been accessed 36,175 times.